Markets could stage a recovery Thursday after three consecutive days of losses. U.S. stock futures are moving higher. 1. Focus on commodities: Crude oil futures dipped below $37 a barrel on Thursday after new data showed oil supply from OPEC hit a three-year high in November. Last week, OPEC -- which is a group of major oil producing nations -- surprised observers by failing to agree on an official quota, leaving production near record highs despite a massive glut. 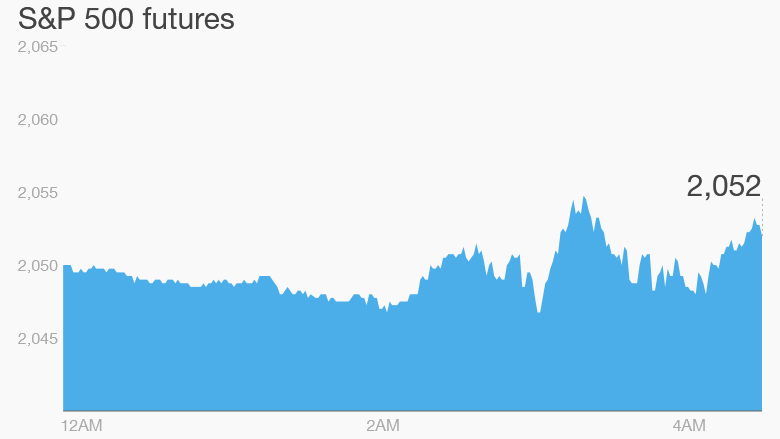 Raw materials such as copper, aluminum and platinum are relatively steady Thursday after collapsing to their weakest levels in more than a decade. But the relief could be short-lived: analysts are warning that a rate rise next week by the Federal Reserve could squeeze commodity prices further. Commodities are traded in dollars. If the dollar strengthens because of higher U.S. rates, prices for metals and other materials may fall further to compensate. 2. Stock market movers -- DuPont, Dow Chemical, Glencore: Both DuPont (DD)and Dow Chemical (DOW)stocks surged nearly 12% Wednesday on reports of a merger between the two companies. Glencore (GLNCY) shares are up 6% in London after it announced further debt reduction plans. Glencore, one of the world's largest mining companies, has been crushed by the slump in commodities. Its announcement on Thursday indicated it is preparing for even lower prices. FMC Technologies Inc. (FTI) is down 1.4% premarket after Bloomberg reported the oilfield services provider is in merger talks with Technip SA (TKPPY). 3. Earnings and economics: Adobe Systems (ADBE) is reporting fourth quarter earnings after the close. Adobe is hoping for growth in its cloud computing business. The Swiss Central Bank kept interest rates on hold on Thursday, following a modest cut by the European Central Bank last week. The Bank of England is also expected to keep rates at record low levels at its meeting on Thursday. 4. International markets overview: European markets are mixed in early trading, while Asian markets ended the session mostly in the red. 5. Wednesday market recap: The Dow Jones industrial average was down 0.4%, while the S&P 500 fell 0.8% and the Nasdaq dropped 1.5%.